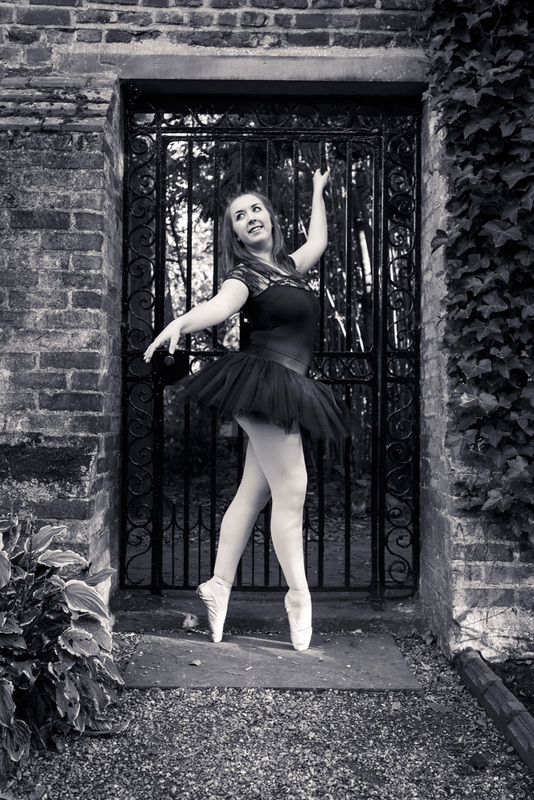 It was a while since I did a ballet shoot, so yesterday I met up with Naomi Stewart, Philippa Carr and Leora Amy Taratula-Lyons from the committee of the Cambridge University Ballet Society. We were photographing at Emmanuel College here in Cambridge. To prepare I had spent some time in the morning looking at YouTube clips and when I found a nice pose I liked I snapped a picture with my phone. A very quick and dirty solution, but it got the job done. One of the things I saw and liked were poses where the dancer was out of balance. It added a sense of suspense to the photo. The weather report had been uncertain most of the week, and on the day it said rain at 17:00, so we had moved the shoot to 16:00 and I had brought both an umbrella and a plastic cover for the camera. My plan was to do a “Singing in the Rain” inspired photo shoot once the sky opened itself. However, we got lucky and the rain clouds passed overhead without dropping their load. It was a relief, but secretly I was a little bit disappointed. Rain would have made the photos look shiny with all the reflections in the wet stones and puddles. 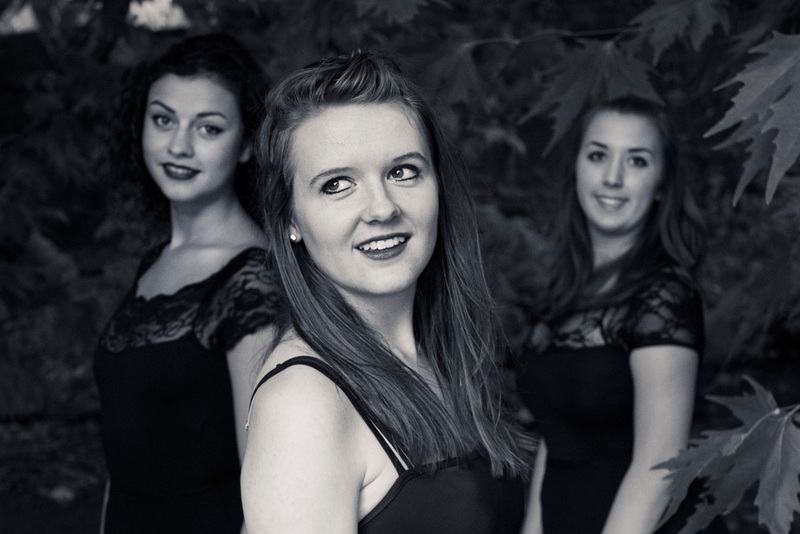 From left Leora, Naomi and Philippa. There is a giant tree in the Fellows’ Garden that looks really great if you go inside and have the leaves back-lit by the sun. 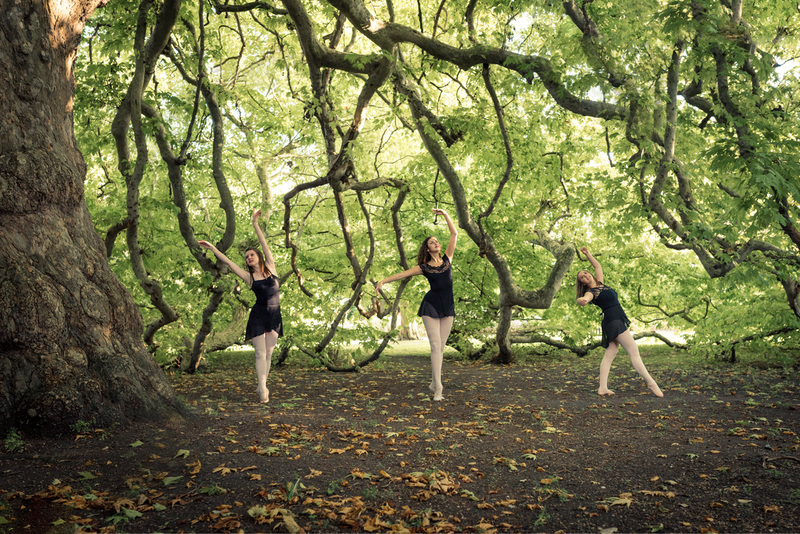 I asked them to find poses that would match the branches in the background. This is actually a composite of two frames. The first one had the right composition, the second one had the right poses. Philippa taking the photo shoot to new heights. Here also we are trying to mimic the branches. Notice that it is difficult when people are wearing black, you run the risk of not seeing any definition in the clothes. This was one of the poses from the YouTube videos that I had watched earlier in the day. I wanted it shot with the sun in the background to create a shadow leading towards me. As you can tell from the angle I was lying on the grass. I have done it so many times now that I do not really think what people might think. Luckily here there were not many other people around. We did not only do serious photos, there was also plenty of time for silly pictures. This photo had quite tricky light, since the background was brightly lit, but the foreground was in shadows. I kept shooting and asking them to change poses after every other frame or so. They were really creative! This is one of the more normal ones. Selfie time. I like how the legs and the tree trunk line up. I hope you can see that there is a mobile phone there in her hands, if not click on it to see a larger version. 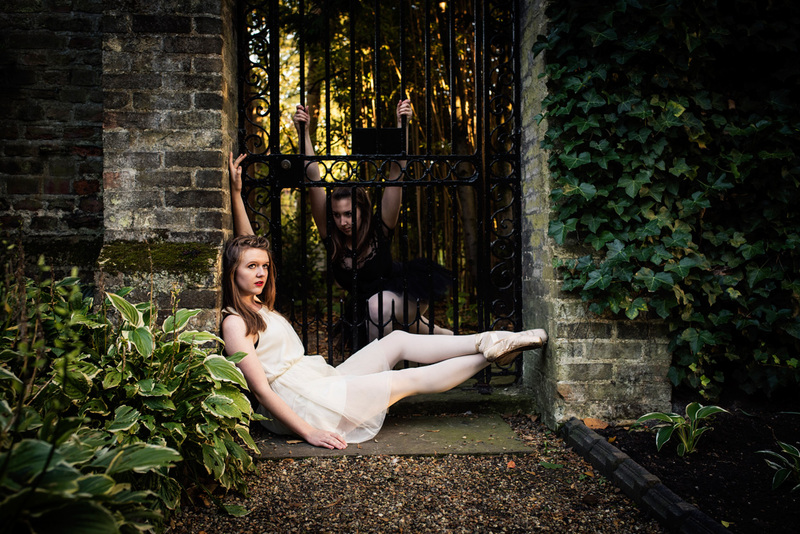 Naomi and Philippa found a gate that they liked. It was locked but it was possible to go around to get to the other side. I also played with making this black and white, but Philippa’s dress disappeared completely in the background then. This photo has a bit of post processing. I have desaturated the greens and yellows, and toned down the blue a bit. Then on top of that added a bit of split toning. I like the pose and expression on Leora’s face here. I liked this tiptoed pose. That is probably not the official name. They were all very happy when we moved away from the grass and gravel to more solid ground. 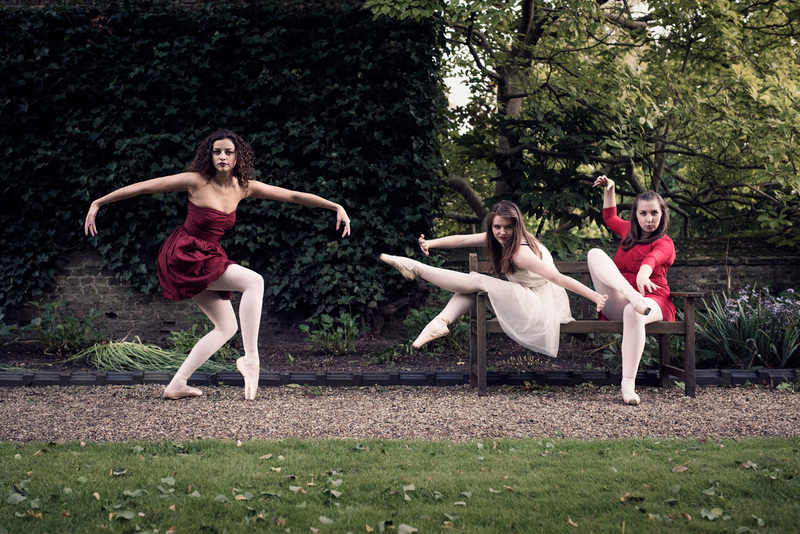 Another crazy photo, I like that there is a line between Leora and Naomi, and Philippa’s kung fu pose is great. It helped that they had brighter dresses here. The black gets a bit tricky when the sun is setting and the light gets worse. 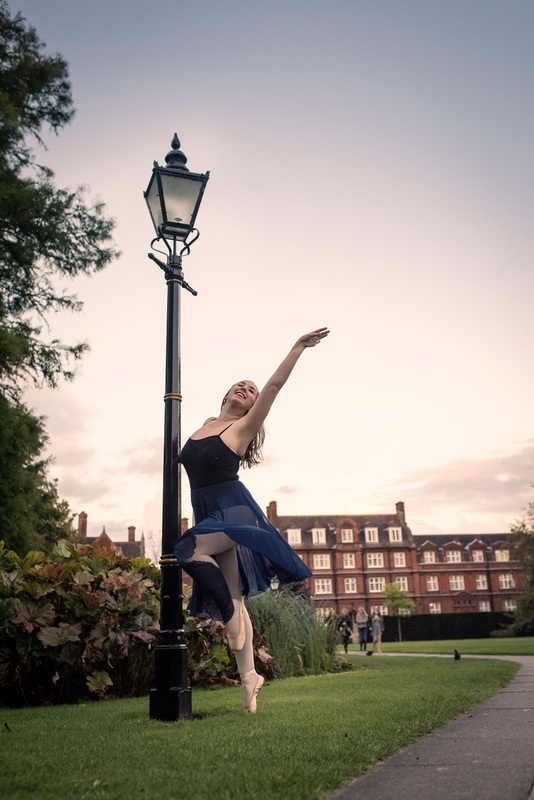 Philippa dancing around the lamp post. This shot is a bit inspired by another shot from last week where my niece was dancing around a road sign in a similar way. I am trying to use the road to frame the shot, and lead the eye to the people walking in the background. Leora striking a pose. A thing I learned from one of the YouTube videos I watched was that all the poses should look effortless, which I think she pulls off beautifully here. 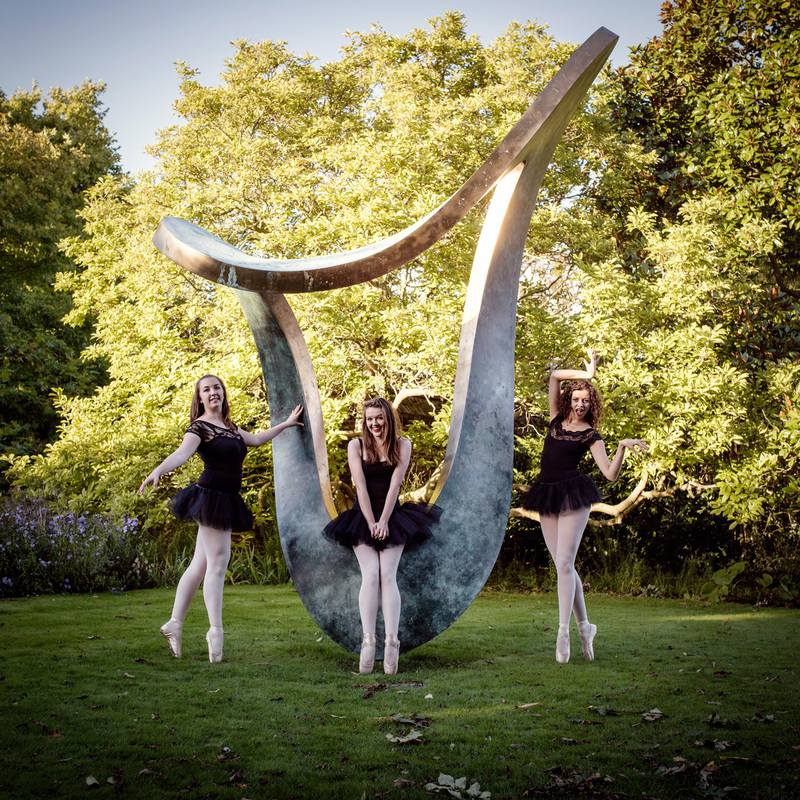 They wanted a Ballet Society Committee photo that looked official, so we came up with this. Last shot for the evening. Naomi had already taken off her shoes, and was typing away on her mobile phone. So I just asked her to join the photo of Philippa and Leora to break the symmetry. 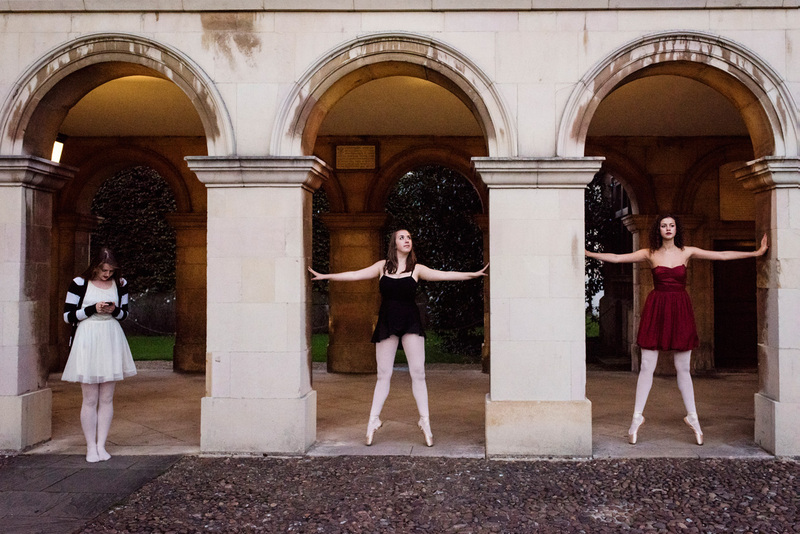 Is this the start of a Cambridge Ballerina Project? I had a lot of fun, and plan on doing this again. Perhaps something on the streets of Cambridge next time. 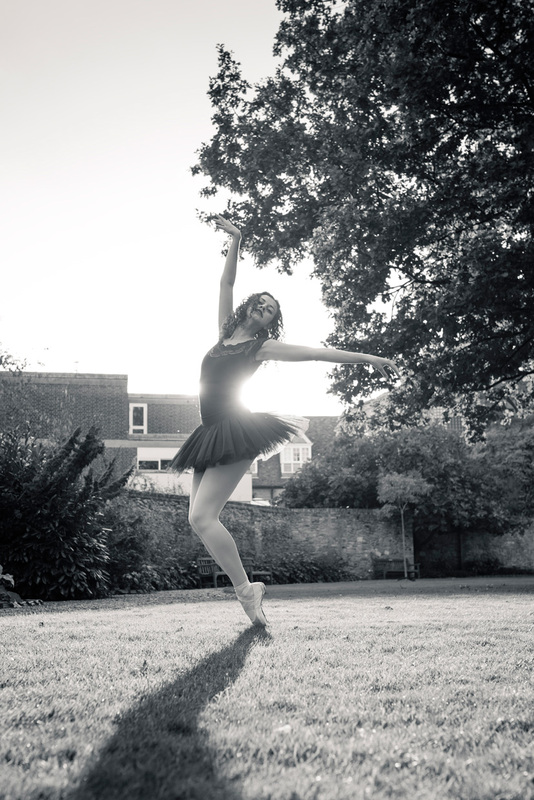 If you want to see more ballet photos, have a look at my old blog posts Morning Ballet with Tara Thean, Urban Ballet and Street Ballet with Joanna Vymeris.